When I started working at Tiller back in 2015 what is now called the Weekly Expense Tracker was our “Standard template.” It gave you a sense of how much you were spending weekly for one or more categories, week over week trends, and details about specific transactions within a select category, and that was about it. As I started leading customer support at Tiller it became apparent we needed something with a little more functionality. Not only did customers need to see exactly where their money was going, but they also wanted to see where it was going in relation to a goal for their max spending in a category. They needed a budget. So we set out to build our little budget that could. We initially released it to a small group of eager and enthusiastic customers. They helped guide the design and provide important input that we used to refine it until it was ready to go out in the wild. That was about a year ago, and here we are again, releasing a new budget template out into the wild. Since we launched the Tiller Budget in June of 2017 we’ve received enormously helpful and valuable feedback from our customers about what they wish it could do. Nearly weekly we were asked about things like rolling over the balance of unspent category funds, how to set and track savings goals, how to use an envelope or zero sum budgeting style, and how to dynamically review budget periods. We’ve taken that feedback and we’ve listened. Our new budget makes all those budgeting tasks possible. 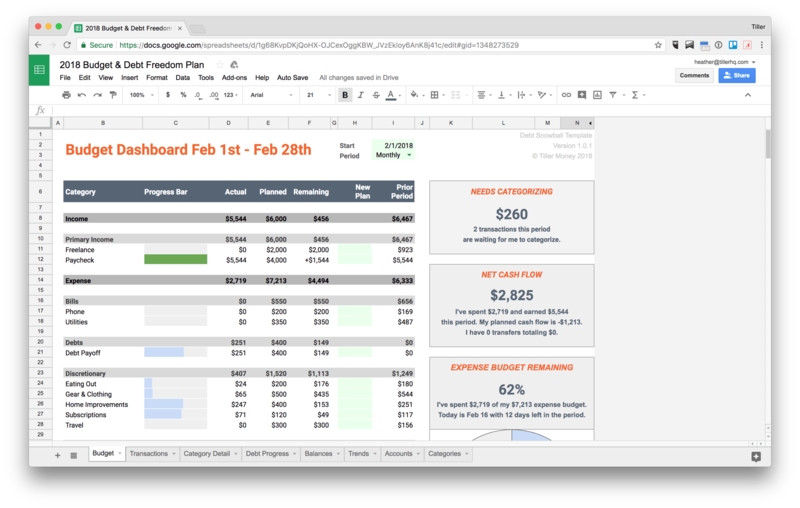 It makes budgeting and understanding your money in a spreadsheet even easier. You can read all about the new features and how to upgrade on our help center here. Being on the frontlines of customer support I also saw how painful the process of upgrading to a new template version can be, and that is, for me personally, one of the most exciting aspects of this new budget release. 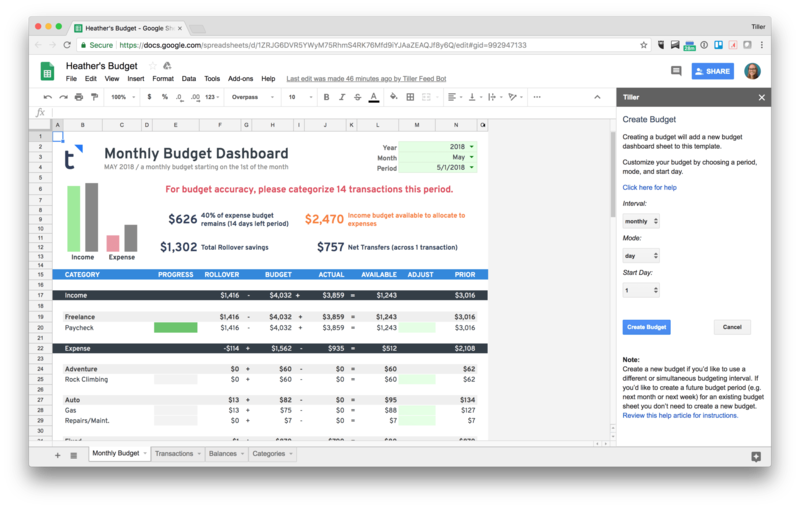 You can get these new budget features in any template. The upgrade is painless through the use of our new Tiller Add-on. Many of you will see this in your Add-ons menu already, if you had already installed AutoCat, our category automator add-on. There are numerous reasons we took and add-on based approach for delivering this new tool, but one of the major ones is the ease with which customers can get the new features, on top of any of their existing Tiller spreadsheets. And there’s more to come. AutoCat is still there in the Tiller add-on under the Tiller Tools menu, and we’ll be adding in new exciting tools and features automatically as they’re ready for release. We’re excited about how our new budgeting tool and add-on will empower our customers to understand and control their money so they can focus on everything else in life that matters more. As always, we’re here to help. Reach out if you come across any issues or have questions if you choose to upgrade.